A pair of new oxidovanadium(V) complexes, [VOL1L]·EtOH (1) and [VOL2L]·EtOH (2) (L = acetohydroxamate), derived from the aroylhydrazones N’-(5-bromo-2-hydroxybenzylidene)-4-methoxybenzohydrazide (H2L1) and N’-(5-bromo-2-hydroxybenzylidene)-4-methylbenzohydrazide (H2L2), have been prepared and characterized by elemental analyses, FT-IR, 1H and 13C NMR spectroscopy and single-crystal structural X-ray diffraction. The complexes have octahedral structures in which the aroylhydrazone ligands behave as binegative donors. 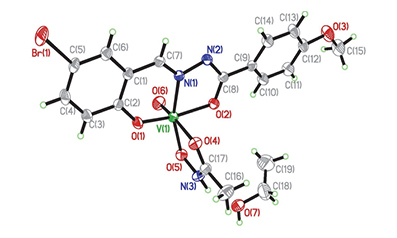 Single-crystal structure analyses reveal that the V centers are coordinated by the donor atoms of the aroylhydrazone ligands, the acetohydroxamate ligands and the oxido groups.Crystal structures of the complexes are stabilized by hydrogen bonds. The complexes function as effective olefin epoxidation catalysts.